We’d love your help. Let us know what’s wrong with this preview of Third Culture Kids by David C. Pollock. To ask other readers questions about Third Culture Kids, please sign up. This is the kind of self help book I would normally despise, with simplistic language and basic content. Because it is MY self help book. I read it as part of pedagogical training for international school children in transition, but after a few lines, I started nodding compulsively. I recognised every single issue and question raised in the book. Every single one. It was a book explaining me. There are certain patterns that third culture kids develop as a reaction to their ear This is the kind of self help book I would normally despise, with simplistic language and basic content. There are certain patterns that third culture kids develop as a reaction to their early exposure to a variety of different languages, school systems, traditions and social codes. They learn to navigate a "home world" and a distinctly different "school world", with some embarrassments and cultural clashes being unavoidable. They learn to handle repeated loss, saying good bye to neighbours, classmates and sports club friends just when they start feeling like "one of them". They learn to make friends quickly, as they know they don't have enough time to wait for relationships to develop naturally. And they learn to adapt to certain behaviours in record time. They know how to blend out stress symptoms and how to play cool on the first day in a new school, how to scan other kids for dress code clues and specific group dynamics. They learn to change hobbies and accents to fit in. They learn to be alone in phases of transition. What they learn out of necessity eventually turns into something they need, expect, want for themselves. Moving becomes a state of mind. When I grew up, my life circled around the question: "Where next?" I get restless when I stay for an extended time in one place. If I can't physically move, I make sure to change within the community where I live. Nothing disturbs me as much as unchanging, stagnant situations. Always looking for new impressions, I follow the pattern of my childhood. At the same time, I feel sadness at having left so much behind, having lost so many contacts, having lost a sense of being rooted in a nationality, a language, a cultural identity. This book explains that. It explores the core of the chameleon that the third culture kid becomes. On the last pages, it took something away from me as well. When I moved back to Sweden after decades abroad, I developed a passionate rage against the Swedish mentality I struggled to identify with. I thought it "objectively" had to do with Sweden being rotten and me being able to see it clearly because I knew there were "better" places, until I read this book and had to admit I had become an internal immigrant, expecting to fit in where I was a stranger, just because I happened to speak the language and hold the passport of the country. Nowadays I refer to Sweden as my passport country, and Europe as my home, and I am much less angry, knowing what triggers my frustration: a feeling of belonging - but only partially. Wow. I finally get myself. A good read, although a bit repetitive and oddly organized at times. Still, a must read for anyone who has dragged their kids halfway around the world (or across the country) to live in a foreign culture or who has been dragged at some point. Gives a good overview of what a TCK is, traits that define them/challenges they face and how they can be handled/overcome. It's not just for TCK's themselves, but parents of such people, those who want to know about TCK's and sponsoring companies. I started this book several times, and read snippets. One time I started it for a paper, I ended up crying because I could relate to a lot of it, and it made me feel lonely. This time I got through it, I still ended up crying during several parts of it, Gives a good overview of what a TCK is, traits that define them/challenges they face and how they can be handled/overcome. It's not just for TCK's themselves, but parents of such people, those who want to know about TCK's and sponsoring companies. Don't fit into your little white upper class suburb that everyone thinks is totally happening? Identify with a culture that is not your own? Need to get out of town every week? Keep wondering where you will go next? Not making friends because one day you might move on? If you have lived overseas and immersed yourself in a culture as a child, chances are you are still carrying baggage from those adventures. Sit down, rest, read and you will discover yourself in these pages. If you need a comfy sofa, 15 minutes, a stiff drink and an indulgent listener to give justice to the question "Where are you from? ", then this is the book for you! Also for people raising cross-cultural children. Highly recommended! Poetry this ain't. It's written in the style of self-help literature and it goes on and on. But I had one "aha" moment after the other as I was reading it. It describes precisely how I felt as a five-year-old with inadequate English at the American Community School in Athens: because I was uncomfortable with my language skills I ended up befriending the other marginalized kids. When my mom volunteered to be a "tour guide for a day" the only two suspended kids in the whole class were in my group of Poetry this ain't. It's written in the style of self-help literature and it goes on and on. It describes precisely how I felt as a five-year-old with inadequate English at the American Community School in Athens: because I was uncomfortable with my language skills I ended up befriending the other marginalized kids. When my mom volunteered to be a "tour guide for a day" the only two suspended kids in the whole class were in my group of five friends. I was OK academically, indeed the school pushed me up a grade, but my parents did precisely what this book says they should do: they pulled me out so I could get a fresh start somewhere else. And it nails how bad it sounded to everybody when my partly French-raised Hungarian/American college roommate deplored the provincial attitudes of his peers from New Jersey. That said, it's mainly a book about the sons and daughters of American missionaries, diplomats and army personnel who were stationed outside America. Them it covers comprehensively. Everybody else is in there just to make the book more complete. Great book, it really helped me understand the mind set of my own kids. Third Culture Kids: Growing Up Among Worlds is one of the best resources for TCK's I've ever found...and most definitely the best book. It's resourceful and practically therapeutic, a must-read for anyone who knows or who is a TCK. I'd definitely recommend this for any TCK's who are leaving their host countries to further understand their experiences. This was a stellar read on the challenges and benefits specific to the TCK (Third Culture Kid) and ATCK (Adult-TCK) lifestyle. Some sections were obvious for a TCK who is now an ATCK (moi), and gave generic advice for raising TCKs that any child should benefit from (stability in the form of generous doses of love, advance information and preparation for major transitions and family decisions, et al). David C. Pollock, the founder of Global Nomads and a number of related TCK organizations, first p This was a stellar read on the challenges and benefits specific to the TCK (Third Culture Kid) and ATCK (Adult-TCK) lifestyle. Some sections were obvious for a TCK who is now an ATCK (moi), and gave generic advice for raising TCKs that any child should benefit from (stability in the form of generous doses of love, advance information and preparation for major transitions and family decisions, et al). David C. Pollock, the founder of Global Nomads and a number of related TCK organizations, first published his book in 1999 under a different title. He re-wrote subsequent editions with co-authors, including the most recent edition I read with Ruth E. Van Reken at the helm, published in 2009 after Pollock's death two years prior. Although his studies and this book mainly speak to TCKs, they also cover CCKs (Cross-Cultural Kids), and "domestic" CCKs, who have mixed heritage and/or move often domestically within the same states, namely the United States. The book focused much energy on TCKs from missionary families and recommended cultivating spirituality in the lives of all TCKs, which makes sense given Pollock's religious background. Since publication, the field of TCK research and sheer numbers of TCKs and CCKs has grown substantially. What I find most beautiful and haunting about this fact is that the worldview of TCKs is humanitarian; less formed on a single ethnicity or nation-state; more often on a set of individually selected values. This is why being American is so beautiful and haunting to me: the only nation on earth to be established upon an ideal, must also evolve within a constantly evolving world. A nation of idealists is indeed the only nation that will continue to survive in spite of millennia of hegemonic history showing the contrary, because it imbues its citizens to strive beyond the predictable pattern of history, and bravely into the frontier of the unknown, self-actualized future. It is this similar mindset TCKs are imbued with; the confidence to navigate the world and unite people under values, not ethnicity. This is a book that has been on my "to-read" list for several years and I finally read it during our vacation to Zanzibar. 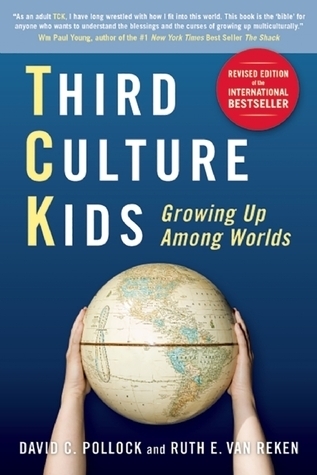 Third Culture Kids (TCK) is a must-read for parents, extended-family and supporters of kids who grow up in foreign countries or cultures in my opinion. The basic premise of the book is that kids who grow up in a different country (like our kids!) end up learning from both home and host cultures and yet never fully becoming part of either one. TCKs and Adults TCKs (ATCKs) hav This is a book that has been on my "to-read" list for several years and I finally read it during our vacation to Zanzibar. Third Culture Kids (TCK) is a must-read for parents, extended-family and supporters of kids who grow up in foreign countries or cultures in my opinion. The basic premise of the book is that kids who grow up in a different country (like our kids!) end up learning from both home and host cultures and yet never fully becoming part of either one. TCKs and Adults TCKs (ATCKs) have unique advantages and disadvantages. They innately understand differences between places and cultures in a way that kids who grew up in one place simply cannot. They also have unique skills in adaptation, relationship-development and language. On the other hand, TCKs and ATCKs also typically struggle with issues of identity, unresolved grief, restlessness and rootlessness. Overall, the book is engaging and well written. Pollock, who has been working with TCKs for over 30 years, uses many stories from TCKs who he has met at the TCK conferences that he runs. The first part of the book deals with his theories related to the unique experiences, advantages and disadvantages of growing up as a TCK. The second part of the book gives practical suggestions for both TCKs and their parents, extended family and supporters on how they can help TCKs to harvest the benefits of TCK life while avoiding pitfalls. I particularly liked the sections related to how to depart and return from periods lived in foreign countries in such a way as to bring closure and avoid unresolved grief. My husband and I have decided that we really need to make a practice of reading this book at the start of each year (or maybe every other year). We had a lot of great conversations together from reading it. I have been very humbled and have stood corrected continually as the authors have thoroughly unpacked the complexities of TCKs in each chapter. I took a lot of notes. This book is full of SO MANY practical tips for parents with regard to things like handling unresolved grief, surviving transi My husband and I have decided that we really need to make a practice of reading this book at the start of each year (or maybe every other year). We had a lot of great conversations together from reading it. I have been very humbled and have stood corrected continually as the authors have thoroughly unpacked the complexities of TCKs in each chapter. I took a lot of notes. This book is full of SO MANY practical tips for parents with regard to things like handling unresolved grief, surviving transition, building strong parent-child relationships, choosing and using mentors, evaluating educational needs, etc. I wish I could read this book to my 15-year-old self. Wow those were some dark times, and with this book everything fell into place. A cathartic read almost. I read this book to help my kids and from the first page it was clearly talking about my childhood as well. So helpful. I was referred to this book by my friend's master's thesis, and was duly impressed. This is an interesting topic to me as many friends of mine have grown up overseas or are in the process of beginning careers working overseas with government, NGOs, or missions organizations. I think this book is a great resource for anyone involved in any way with people raising families within multiple cultures. I'm interested to see if there is any research on the similarities and differences between growing u I was referred to this book by my friend's master's thesis, and was duly impressed. This is an interesting topic to me as many friends of mine have grown up overseas or are in the process of beginning careers working overseas with government, NGOs, or missions organizations. A comprehensive look at the life of those who live between worlds. This book never gets old for me, even as I revisit it as an adult. It's a great read for anyone who has or continues to struggle with their own identity as a third culture kid, as well as their loved ones. If you're going to raise a family overseas, or want to understand someone who has been a part of that, I highly recommend this book. I wish I could go back in time and make my parents read this book before they had me. If you live overseas for any period of time with children, you need to read this book. I see so many people doing their kids a huge disservice by not recognizing the impact living overseas has and will have on their kids. I think it can be a wonderful experience for kids if you are aware of the issues, and this book clearly states what they are. Still actually finishing this book after reading it in chunks for 3 years. Why is it taking so long? Because reading it gives me the very intense experience of someone explaining some of the most intricate pieces of myself to myself. A must read for ATCKs like myself and for TCKs (and their parents) as I wish I and my parents had read this before and during my growing up abroad years. In short I loved this book because it showed me what I was feeling and why. I have been feeling lost for a long time since returning back to my home country and I didn't know why. A friend recommended this book and after reading it I found out what and why I was feeling the way I was. It also helped me ease the transition of returning home and integrating into a mono cultural society. Such an interesting subject for all us expats who either spent our childhood and/or youth in different countries or/and are now raising children in a country that isn't "ours". Unfortunately the writing is quite dull and awfully repetitive so I couldn't bring myself to finish the book but we had a very lively, fun discussion at book club (all of us TCA or raising TCK) anyway. I identified so much with this book and wished I would have read this years ago upon re-entry. However, I still found the book useful as an Adult Third Culture Kid (ATCK)--the life experiences had at a younger age definitely color adult perceptions of the world, and it was refreshing to learn that my general outlook is normal based on my childhood. I appreciated how Pollock and Van Reken were so open about the struggles TCKs, especially MKs, face: crises of faith, acting out, poor relationships, etc. Not that all TCKs/MKs will face these issues, but Pollock and Van Reken were so non judgemental about it. They identified the problems, then gave steps to remedy the issue and who to look for to help. Overall, this was an excellent book applicable to any stage of the TCK/ATCK experience. I wish I/my family had read this book years ago, but there was still so much value reading this as an ATCK. Highly recommended for all future, current, and ATCKs and their families.